The LG V40 has been revealed, complete with its five-camera setup. 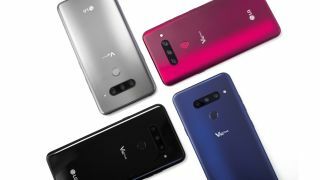 The LG V40 ThinQ has finally been revealed and it is indeed packing five (count 'em) cameras. The phone is the latest from LG to come under the ThinQ moniker, which essentially means it has some AI smarts baked into the software. I comes with a 6.4-inch 19.5:9 QHD+ OLED FullVision Display (3120 x 1440 / 538ppi), up to 128GB UFS 2.1 ROM / microSD (up to 2TB) and is using the Qualcomm Snapdragon 845 chip. But that's not really why you are here, is it? What you really want to know is about the cameras and just why there are five on board LG's latest smartphone. LG has gotten a little greedy with its camera set up on the LG V40. On the back there are a: 16MP Super Wide (F1.9 / 1.0μm / 107°), 2MP Standard (F1.5 / 1.4μm / 78°) and a 12MP Telephoto (F2.4 / 1.0μm / 45°). The pixel size of the main rear camera sensor is up 40% compared to the LG V30, increasing from 1μm to 1.4μm. When it comes to the image sensor, this is more than 18 percent larger than in the LG V30. Aperture wise, the main camera clocks in at F1.5 and shutter lag has been improved. The inclusion of the telephoto lens means that this camera makes a reappearance on an LG handset, having originally been on the LG V10 and taken off both the LG V20 and V30 editions of the smartphone. The front cameras include an 8MP standard (F1.9 / 1.12μm / 80°) lens and a 5MP Wide (F2.2 / 1.12μm / 90°) lens. In addition to the optics, there are also myriad features that make use of the five cameras - these include Cine Shot, Triple Preview, Triple Shot and AI CAM. There's also some post production board, in the form of: 3D Light Effect, Makeup Pro and Custom Backdrop. According to LG, Cine Shot is its very own gif-life maker, which adds a little bit of movement to your stills. 3D Light Effect changes the tone of a photo with professional-looking lighting and Make-up Pro adds a little smoothness to your selfies. Custom Backdrop does exactly what it says on the tin, where you can completely change the back drop of your selfie. Fancy. That's what the LG V40 offers on paper, but what's it like to use those five (count 'em) cameras? Well, it's a bit of a mixed bag. The reviews are in and the LG V40 ThinQ cameras and it's a little mixed. Matt Swider from TechRadar reckons that "the best photos come from the 12MP standard camera" but there is an "aggressive use of contrast, with photos skewing toward deeper reds and yellows" compared to its competition. He like the super wide angle but found the edges of the shots to be blurry. He also thinks there's a bit of a flaw in the camera setup, noting: "any photo we took using the Triple Shot mode (which cycles through all three cameras) forces the telephoto lens to be used, even in low light situations. Hence, blurrier-than-normal shots." Caitlin McGarry from Tom's Guide also thinks the Triple Shot mode is "a gimmick", explaining that the LG V40 ThinQ cameras "seem gimmicky instead of high end. The results don't look like they were shot on a DSLR, which has become my bar for an expensive camera phone. She continues: "With so many other smartphone makers adding (or rumored to be adding) extra lenses to their devices, splurging on this particular LG handset is a decision you may regret in a few months." One big plus point, however, was Cine Shot as "it's much more fun to play with than Portrait or Triple Shot." These are the best camera phones available right now.